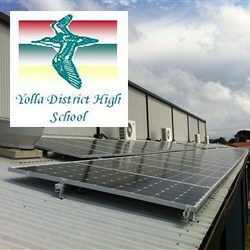 Yolla District High has a 16kW system entailing 64 Suntech Solar Panels on the roof of the school gymnasium connected to a Sunny Tripower 15000 Inverter. The monitoring is done through a Sunny WebBox. Click here for more information and statistics on the plant.